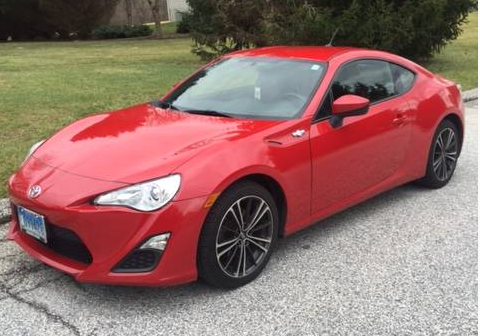 Looking for a Used FR-S in your area? 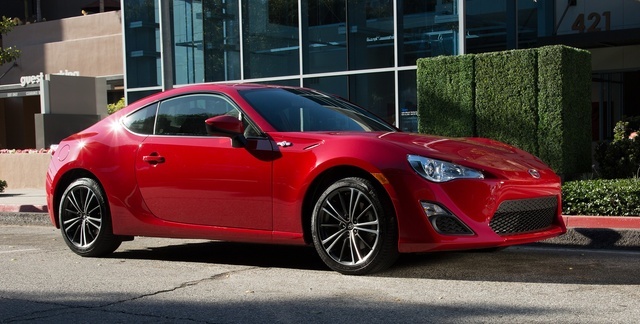 CarGurus has 573 nationwide FR-S listings starting at $8,995. After years of development and several tantalizing concept cars, the FR-S first became available for the 2013 model year. Toyota had been toying with the idea of a cheap rear-wheel-drive sports coupe for a time, and Subaru came in to help develop a production version, primarily in the design of a 4-cylinder boxer engine. The jointly developed car became affectionately known as a “Toyobaru” and was sold by both Subaru (as the Subaru BRZ) and Toyota's Scion brand (as the Scion FR-S) in North America. The car quickly gained a following among driving enthusiasts who appreciated an entertaining, rear-drive performance car in an affordable 4-cylinder package. While there were several such cars coming out of Japan in the 1990s, in recent years the only car comparable to the FR-S has been the Mazda Miata. The 2-seat convertible Miata, however, is much less practical than the 4-seat coupe being sold by Scion. The FR-S is a performance car designed for fun rather than putting out impressive numbers on a spec sheet. It’s a direction that precious few carmakers take, but it’s one that appreciative buyers have responded to, and it has made the Toyobaru a sales success in the U.S.
2016 sees the first significant update for the FR-S, and though nothing revolutionary has changed, there are several noticeable cosmetic updates including silver accent trim throughout the interior, as well as a few new colors, a new audio system, and a rear-view camera. These changes also mean a $400 increase in price, but the car still comes in well under $30,000 and still offers more fun per dollar than any other new car on the market—with the exception of the almost-identical Subaru BRZ. The 2.0-liter horizontally opposed 4-cylinder in the FR-S makes an impressive 200 hp, but torque is nothing more than adequate at 151 lb-ft, so you'll really have to keep the revs up to get much grunt. Keeping it in the power band is all part of the fun, however. Although the 6-speed manual is a pleasure to operate, an automatic also remains available. The FR-S will get from 0 to 60 mph in 6.8 seconds, and while it’s not setting any world records, the car is about the thrill of driving; an FR-S is more at home on a road course than a drag strip. Recognizing that the FR-S particularly appeals to tuners and track-day enthusiasts, Toyota has made several performance upgrades available through Scion dealerships, including a cold air intake, an upgraded exhaust system, lowering springs, strut tie braces, brake kits, and anti-roll bars. As for fuel economy, although it takes premium fuel, the FR-S does pretty well with its small naturally aspirated 4-cylinder and achieves 25 mpg city/34 highway. At around 2,800 pounds, the FR-S is no featherweight, but for a modern car with 4 seats, it's quite trim. Luckily, the interior isn’t sparse, and storage space is more adequate than it looks. Scion claims that the interior layout was designed to hold 4 wheels and tires, a toolbox, and a helmet so it would be ideal for a day at the track. The interior itself is basic but adequate and fairly attractive. A premium audio system is available, but navigation is one notable option that is missing. Navigation does, however, come on the FR-S’s sibling, the Subaru BRZ. The FR-S comes with 6 airbags, antilock brakes, stability control and traction control, as well as the-new-for-2016 rear-view camera. In crash tests, the car has also already earned a 5-star overall score with the National Highway Traffic Safety Administration (NHTSA) and the Insurance Institute for Highway Safety (IIHS) has rated it Good and given it a Top Safety Pick award. If you want an affordable car that you can drive every day and that will accommodate luggage, ferry the kids to school, get impressive fuel economy, and protect you in a crash, you have plenty of choices. If you want a car that does all of these things but also has rear-wheel drive and will thrill you to pieces on the back roads or the occasional track day, your only real choice is whether to go for the Scion FR-S or the Subaru BRZ. What's your take on the 2016 Scion FR-S? Users ranked 2016 Scion FR-S against other cars which they drove/owned. Each ranking was based on 9 categories. Here is the summary of top rankings. Have you driven a 2016 Scion FR-S?